Finally, I am getting around to reading a biography. Some have differing opinions on the value of biographies, but I think they can be very helpful. By definition a biography is a written account of another person’s life and usually written because they have had a significant impact on mankind in either helpful or unhelpful ways. Biographies tend to be written by those that have been influenced or intrigued by the person they’ve written about. 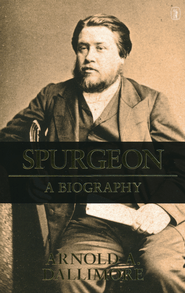 The biography I am reading now is Spurgeon: A New Biography by Arnold Dallimore. I’ve always desired to read a Spurgeon biography, but didn’t know which one to read. At the recommendation of my pastor, I am reading this one. I actually received the book from my now wife for Christmas in 2010 when we were dating and I am really looking forward to it. I found it interesting that the author’s grandfather and mother used to attend the Metropolitan Tabernacle during Spurgeon’s time there. The reason why I am reading a Spurgeon biography is because he is an example of God’s grace on a man submitted to Him. As it seems, there has been no pastor that has been more fruitful in the modern era than Spurgeon. His accomplishments and fruit are unrivaled for the short life he lived. It is said that he read an average of six books a week and retained the information remarkably. His sermons were published in newspapers. He started orphanages. He founded a pastor’s college. He was also noted as a remarkable evangelist…..as a Calvinist! (some of you will get that joke) All of this the Lord accomplished through him despite health issues he and his wife suffered from. Sparing you the details, Spurgeon was a remarkable example of endurance as He held on to the Word of Truth deeply in his heart. Thus he became known as the Prince of Preachers. This entry was posted in Books, Take Up And Read! and tagged Calvinist, Prince of Preachers, shai linne, Spurgeon. Bookmark the permalink.